I had planned out my days so well. My oldest one started mandatory full-day kindergarten and I decided to send my middle child to afternoon class in preschool in hopes that I’d get an hour or so of time for myself while my baby is taking his afternoon nap… It hasn’t quite worked out like that. Most days he falls asleep for his morning nap too late so that despite my repeated, and sometimes desperate, attempts that can take up to an hour of trying to put him down for a nap in the afternoon, he refuses to fall asleep before I have to pick up the girls from school, only to then zonk out immediately once I put him in his carseat. Or, alternatively, he falls asleep on my way back from dropping off my middle child at school and then wakes up immediately once I lift him out of the carseat when we get back. I think it’s safe to say that he really loves sleeping in his carseat, just as much as I do not love sitting in the car in our driveway wasting time waiting for him to wake up. This week has been a bit different. Two days ago, I was able to successfully transfer him from the carseat to his bed and today I was able to get him down for a nap right after I got back from the afternoon school-drop-off round. It had to be celebrated with a photo of him sleeping peacefully in his side-carred crib. 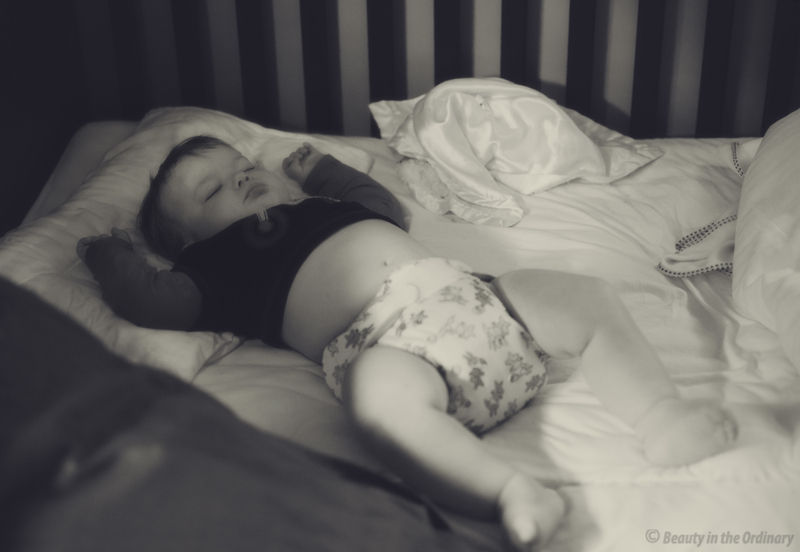 I added a soft-focus filter to the image in Photoshop to accentuate the sleepy atmosphere. I haven’t decided if I actually like it or not, but I’d rather not “sleep on it” another day, so dreamy soft-focus photo is getting posted tonight.